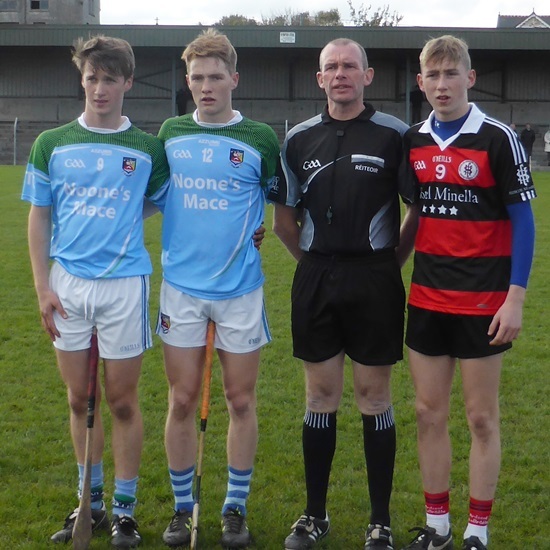 Castletroy College edged out High School Clonmel in the opening round of the Dr. Harty Cup Group C played at Sean Treacy Park Tipperary Town on Monday afternoon. On a bright, sunny day for hurling, High School Clonmel won the toss and elected to play against the wind. This looked like a great idea when the Clonmel side raced in to a 1-3 to 0-0 lead after 10 minutes, the goal coming from Sean Martin. After hitting a number of wides, Castletroy eventually opened their account in the 12th minute courtesy of a Mark O’Dwyer free. Soon afterwards, Castletroy scored their first goal when Ronan Reale blocked down an attempted clearance by the Clonmel goalkeeper. By the end of the first quarter, the sides were level at 1-3 apiece. Castletroy had now found their rhythm and scored their second goal in the 24th minute courtesy of Darragh Cullimore. On the stroke of half-time, Castletroy got in for their third goal scored by Ronan Reale and at the interval, the Limerick side led by 3-5 to 1-5. High School Clonmel with wind assistance in the second half got off to the best possible start with three unanswered points in the opening five minutes after half-time to reduce the deficit to three points. After a period of missed chances on both sides, the High School Clonmel added further points in the 44th and 49th minute to leave just the minimum between the teams heading in to the final ten minutes. Castletroy had yet to score in the second half until Conor Nicholas converted a long range shot from play to put them back in front by two points. The High School Clonmel were still dominating the general play however and scored two further points to bring the sides level in the 57th minute. The game was now flowing from end to end with the next score being crucial. That score duly arrived in the 58th minute when a long range shot by Sean Martin sailed over the crossbar for a Clonmel point to give them the lead. Their advantage was short lived when from the resultant puckout, Castletroy won a 20 metre free which was duly converted by Mark O’Dwyer to bring the sides level again. There was still time for one last piece of drama as Castletroy College worked the ball to full-forward Ronan Reale who scored a point from play as the game entered injury time. High School Clonmel tried their best to find an equaliser but the Castletroy defence stood firm to ensure a hard earned one point victory as referee John McCormack blew up for full-time. Both of these schools will now play P.S. Blackwater with the top two sides qualifying for the last 16. This entry was posted on Monday, October 24th, 2016 at 9:36 pm and is filed under events, News. You can follow any responses to this entry through the RSS 2.0 feed. Both comments and pings are currently closed.